The Montana glassware range consists of good quality stemmed glasses with a traditionally crafted character. They are affordable, stylish and dishwasher safe, so are perfect for everyday use. Montana has been popular since 1999 because of its unmistakeable, timeless design and unbeatable price. 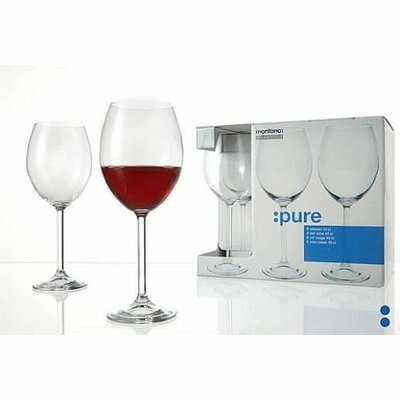 The Red Wine glass from the Montana Pure range is a great all round beginner glass, the wide bowl and enclosed opening means the wines aromas are trapped within the bowl. You can use these glasses for all types of red wine, whether you like your bold red classics like Bordeaux or Burgundy or you're more a fan of Syrah or Shiraz. The long-stemmed, tulip-shaped red wine glasses are part of the classic combination for complete red wine enjoyment. Machine Made. Dishwasher Safe.